From 30 November 2018 to 3 March 2019, the National Army Museum will exhibit the work of Sir Alfred Munnings (1878-1959) in 'Alfred Munnings: War Artist, 1918'. The exhibition, developed by the Canadian War Museum (Ottawa, Canada) in partnership with The Munnings Art Museum (Dedham, UK) and generously supported by The Beaverbrook Canadian Foundation, will display over 40 paintings created during the final year of the First World War, shown together for the first time since 1919. Covering a number of themes the exhibition shows Munnings' emerging mastery of equine subjects, portraiture and pastoral landscapes. Munnings' wartime artwork displays the skill that led to him securing admittance to the Royal Academy of Arts in 1919 and contributed to his role as one of Britain's most celebrated equine artists. The exhibition is locally supported by Juddmonte and supplemented with works from the National Army Museum's own collection relating to General Jack Seely, who commanded the Canadian Cavalry Brigade throughout much of the war. 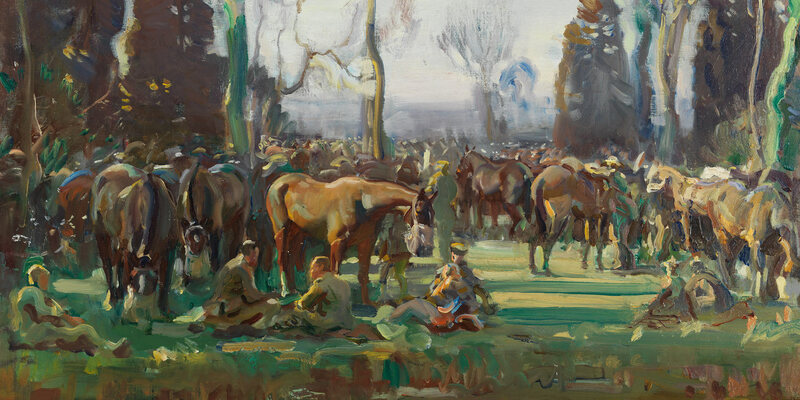 Munnings was commissioned by the Canadian War Memorials Fund as an official war artist, to capture the fighting front and the crucial logistical work behind the lines. In early 1918, he was embedded with the Canadian Expeditionary Force, an army comprised largely of citizen soldiers fighting on the Western Front. The Canadian War Memorials Fund was created by Lord Beaverbrook to document and memorialise the Canadian war effort at home and overseas through paintings and sculpture. 'The Beaverbrook Canadian Foundation is delighted to bring this important collection of Munnings' art to the UK for the first time. My great grandfather commissioned many artists to capture the emotion of the First World War. One of the most important among these was Alfred Munnings, who produced evocative images of the Canadian Cavalry Brigade and the Canadian Forestry Corps, which can be seen in this exhibition. We are pleased that this extraordinary collection will be able to be seen by a new audience at the National Army Museum,' said Max Aitken, President of The Beaverbrook Canadian Foundation. The exhibition will be accompanied by a book edited by Dr Jonathan Black, 'Alfred Munnings: Memory, The War Horse and the Canadians in 1918', and a public programme at the National Army Museum. Tickets can be booked in advance at www.nam.ac.uk/munnings and cost £6 (plus concessions). For more information, please contact Claire Blackshaw at cblackshaw@nam.ac.uk or 020 7881 2433. General admittance to Museum is free. Sir Alfred James Munnings (1878-1959) achieved renown as one of Britain's finest painters of horses. During the First World War his engagement by Lord Beaverbrook's Canadian War Memorials Fund led to a series of prestigious post-war commissions. Alfred Munnings was born into a miller's family at Mendham, Suffolk, on 8 October 1878. At 14 he was apprenticed to a Norwich printer and attended the Norwich School of Art. He lost sight in his right eye in 1898 at the age of 20, when a bramble sprang back into his eye whilst lifting a hound puppy over a stile. From 1899 Munnings began to earn a living as a painter and had his works accepted for the Royal Academy of Arts' Summer Exhibition every year thereafter. At the outbreak of the First World War Munnings attempted to sign-up with a number of regiments but was unsuccessful due to his poor eyesight. In 1917, he managed to secure a position with the Army examining horses at Calcot Park, near Reading in Berkshire, where horses were checked for diseases and parasites, before being sent off to artillery, cavalry, or supply units. Munnings was then asked to join the Canadian War Memorials Fund art programme in 1918 and was assigned to paint the Canadian Cavalry Brigade and Canadian Forestry Corps. His first work for the fund was an equestrian portrait of the commander of the brigade, General the Right Honourable JEB Seely, painted less than a mile from the front line. The artist considered his experiences with Canadian units to have been among the most rewarding events of his life. He believed that when Richard Jack (the British painter who had been the first artist hired by Lord Beaverbrook) sponsored him for associate membership in the Royal Academy in the spring of 1919, it was due to his contributions to the Canadian War Memorials Fund. Munnings was elected president of the Royal Academy of Arts in 1944 and received a knighthood from King George VI the same year. Following his death in 1959, his second wife, Violet, helped turn their home into a museum of his works, which is known today as The Munnings Art Museum. Sir Alfred's ashes are interred at St Paul's Cathedral, London. As part of his legacy Lord Beaverbrook set up two charitable Foundations bearing his name. The Beaverbrook Canadian Foundation, established in 1960, is a charitable foundation located in Montreal, Quebec and is proud to support selected organisations, predominantly in New Brunswick, in the areas of education, the arts and culture. Together with The Beaverbrook Foundation, based in the UK, the Foundations have made donations to over 900 charities in the last 60 years. The Canadian War Museum is Canada’s national museum of military history. Its mission is to promote public understanding of Canada’s military history in its personal, national and international dimensions. Work of the Canadian War Museum is made possible in part through financial support of the Government of Canada. The Munnings Art Museum is at Castle House, the former home and working studio of Sir Alfred Munnings in Dedham, Essex. After Munnings’ death in 1959 the house, with all its contents, was opened as an art museum by his widow, Violet, Lady Munnings. Today, the museum presents changing displays of the artist’s life work as well as special themed exhibitions. Juddmonte is one of the world’s leading breeders of thoroughbred horses, and has to date bred over 100 individual Group/Grade 1 winners of over 200 Group/Grade 1 races, including 25 Classic winners. All its homebred progeny are raced in Khalid Abdullah’s famous green, pink and white colours. Juddmonte has farms in the UK, Ireland and the USA, standing its European stallions at Banstead Manor Stud near Newmarket, England, and its US stallions in Kentucky, USA. Its current roster of stallions includes world champions Frankel, the highest rated horse since records began, and Arrogate, the highest earner in horseracing history.